Good Samaritan Sister Margaret Malone reflects on the experience of walking the Camino Salvado, a seven-day pilgrimage from Perth to New Norcia in Western Australia. You might remember a Compass program on ABC television two years ago which traced a group of pilgrims on a journey from Perth (the parish of Subiaco) to New Norcia. Last year there were two more such pilgrimages and this year also two. I was able to join one that left Subiaco with 23 other pilgrims on August 21 and reached New Norcia late afternoon on August 27. We walked 170 kilometres in the seven days, averaging about 24 kilometres a day. It was strenuous and challenging at times. In 1846 Dom Salvado, a Spanish monk, made this journey as he and his companions set out to establish the New Norcia mission with a primary concern for the care of the Aborigines. This activity of Benedictines was happening in Western Australia at around the same time as Archbishop Polding was active on the east coast, so the foundation of our community, the Good Samaritans, was in the same era. Salvado often journeyed to and from Perth during the establishment of New Norcia and as near as can be known this pilgrimage followed some of the routes he took. People have always walked pilgrimages and no doubt there are many reasons for doing so. Some reasons may be spiritual to remember a sacred event; some may be physical, a test of endurance; some may be simply to seek some days of quiet away from the normal busy life. For me the significance lay in the fact that the starting point of the journey was a place called Subiaco and the end point was New Norcia, places called after ones of great significance in St Benedict’s life and hence to all Benedictines. On the way, the countryside and the bush seemed lush after recent rains and wild flowers were blooming. There were acres and acres of canola providing a yellow panorama. Certainly there was some beautiful scenery to take our minds off weary bodies and sore feet. There were paths through bushland and farmland and sometimes almost no paths at all. For the first time since this Camino Salvado began, the route was almost completely off main roads. There was often time for quiet when we walked on our own and then time for talking and sharing at other times. It was a powerful experience to share in the stories of peoples’ lives as we walked. In the quiet times I walked in the rhythm of a repeated phrase from a psalm or a text from the Gospel and many a time I prayed in the words of the poet ee cummings: “I thank you God for most this amazing day”. When the going was tough there was always the psalm line: “O God come to my assistance, O God make haste to help me”. Somehow we seemed able to begin each day with renewed strength and eagerness. It was exciting to arrive at New Norcia, to be welcomed by the bells of the church ringing out, and then move to the Abbey Church for the final prayer. This was very moving as Abbot John greeted us, then read from the Rule of St Benedict, Chapter 53. “All guests who present themselves are to be welcomed as Christ, for he himself will say: I was a stranger and you welcomed me… The abbot shall pour water on the hands of the guests and the abbot and the entire community shall wash their feet”. In fact the Abbot did wash the feet of two of the pilgrims and many of the group were moved to tears at this powerful ritual of hospitality and service. It was good to have Good Samaritan Sister, Carmel Posa, from our community there to welcome me. We are both involved in various programs at New Norcia so have close connections to the place. We prayed together each morning before we set out, and on the Saturday morning as we left for our final day’s walk, the prayer included the idea of reflecting on our inward journey and what this journey will mean to us as we continue our journey through life. It ended with these words: “We give thanks to Dom Salvado, his monks and the monastery at New Norcia and the history they created which we are sharing and celebrating in his memory”. This recalled for us again the purpose of what we were doing. As I commenced the journey I had been reminded of a phrase from the poet John O’Donohue. I did experience a new silence as I walked and for me this was indeed a sacred journey. 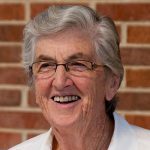 Good Samaritan Sister Margaret Malone trained as a teacher and taught at all levels; her last appointment was as a lecturer at Australian Catholic University where she taught sacraments, liturgy, and social justice. Since then, her main work has been in developing formation programs throughout her own order, and in giving retreats internationally and nationally. What am I doing about poverty?